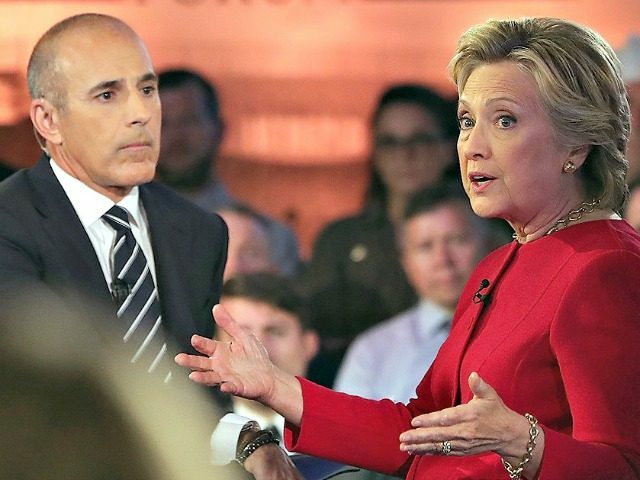 Hillary Clinton took a shot at disgraced NBC host Matt Lauer in Philadelphia Thursday, apparently still stewing about a tough interview she received from Lauer during her doomed 2016 presidential campaign. “Every day I believe more in karma,” Clinton said at the event promoting her campaign post-mortem What Happened, according to the Philly Voice. She was referring to Lauer’s firing this week amid allegations of sexual misconduct. Clinton reportedly went on to claim that several “men who shaped the narrative” during the campaign have since been sidelined by sexual harassment claims. 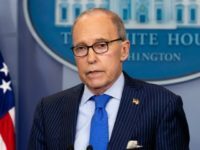 Clinton was given a grilling by Lauer in September 2016 at an NBC forum, infuriating her supporters, who were used to her being handled with kid gloves by sympathetic mainstream media journalists. Clinton ranted about the episode at length in her book, saying she was “ticked off” by Lauer’s line of questioning. Clinton also claimed that her campaign “got a great vote in Philadelphia,” although she went on to lose Pennsylvania in one of the most decisive results on Election Night. The Voice reported on one particularly awkward moment, wherein Clinton “launched into an extended coughing fit,” similar to those she became known for on the campaign trail. This reportedly led Weiner to make a “self-deprecating joke about her own last name” — apparently referring to disgraced former Rep. Anthony Weiner, whose sexual impropriety led to FBI Director James Comey’s decision to re-open the investigation into her email use just weeks before the election.